I added a managed metadata column to a document library (KBCategory). The column was crawled because I can see it in my Search Schema. 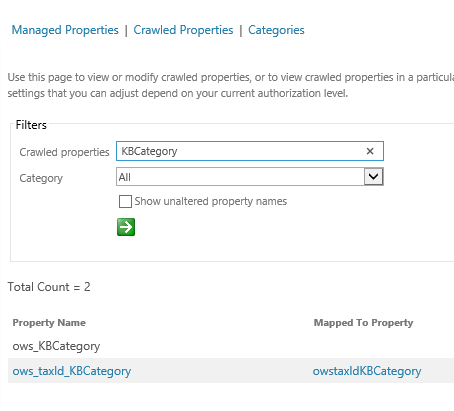 Can anyone explain why there are two crawled properties (ows_KBCategory and ows_taxIdKBCategory)? I would like to customize an item display template to surface this information. Do I use the automatically mapped managed property below, or should I create a managed property and map the "Non taxId" property? The ID property is used to get terms which are tagged or are a children of a term. So in your case the regular ows_KBCategory should be sufficient. Not the answer you're looking for? Browse other questions tagged search managed-property search-schema or ask your own question. Map a calculated column to a managed property? Is this Managed Property correctly mapped to the corresponding Crawled property?